Today, the Secretary of State audit team and I released an audit showing that adoption of a statewide eProcurement system (such as OregonBuys) could have potentially produced more than a billion dollars in savings if it had been in use during the last biennium. If quickly implemented statewide, savings of this magnitude could close Oregon’s 2019-21 budget gap without raising taxes. I’m pleased that my office will be the first agency in the state to begin using OregonBuys in a few months. Governor Brown wants to expand this to all agencies, and I will partner with her in any way I can to move this forward. Our audit research shows that an eProcurement system is estimated to save between $400 million and $1.6 billion, with savings likely continuing in future years. The 2019-21 structural budget gap is $623 million, so this project could potentially allow the state to maintain current service levels within expected record-breaking revenues of $22.63 billion and without new taxes. This is great news! 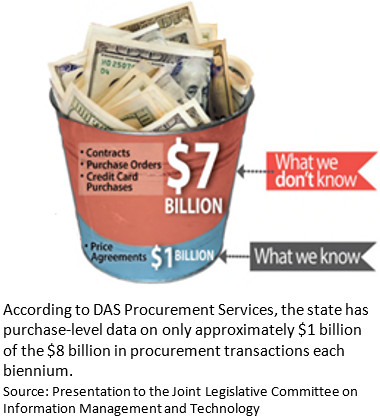 During the 2015-17 biennium, DAS Procurement Services administered approximately $8 billion in procurements of goods and services. Expanding upon research by the National Institute of Government Purchasing, auditors found that Oregon missed opportunities to save as much as 5% to 20% of the state’s procurement budget due to lack of modern procurement systems and practices. For comparison, the state of Georgia reported saving 11% through modern procurement. The state’s current systems lack the information necessary for procurement specialists to effectively evaluate spending to identify opportunities for cost savings. Of the $8 billion spent in procurements in 2015-17, the state only has purchase-level data for roughly $1 billion. Moreover, auditors found this data was lacking in quality. Statewide implementation of an eProcurement system would provide the additional data needed to perform a full spending analysis that could identify hundreds of millions in additional potential savings. This audit shows one of many ways Oregon can balance future budgets through efficiency and better prioritization instead of new taxes. Take a moment to appreciate the tremendous magnitude of estimated savings between $400 million and $1.6 billion. That equals between $96.55 and $382.21 per person for every Oregonian. This audit is a budget game changer. For background, as a State Representative, I was co-chair of Oregon’s budget-writing Ways and Means Committee in 2011-2012. At that time, Oregon was expecting a significant increase in state revenue but still facing a structural gap of several billion dollars for the 2011-13 budget. I am proud to have led the successful effort to balance that budget through efficiency and better prioritization without raising taxes back then, and I’m equally proud to help lead this effort again today as the first agency to implement OregonBuys. Our work will allow other agencies to implement this program quickly by following our model. DAS has said that they will not implement OregonBuys until June 30, 2021. This is too long. 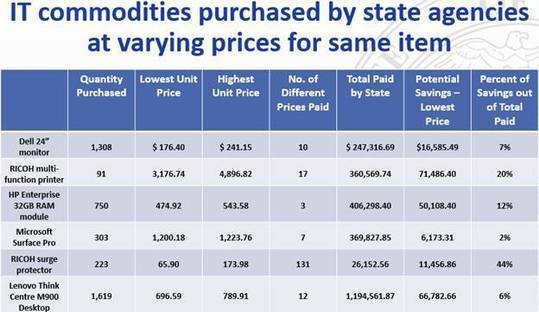 Work already done by the procurement team at the Secretary of State’s office could be copied to implement the program much faster statewide, if there is the will to do so. On average, Oregon could be leaving between $16 million and $66 million per month on the table for each and every month that implementation is delayed. Faster implementation should be a much higher priority. Today’s audit also analyzes oversight processes and the cost of independent quality assurance (QA) services needed for major IT projects. While oversight processes are improving, the audit found that more needs to be done to mitigate significant procurement risks associated with major IT projects. Auditors evaluated procurement practices and IT projects across 10 executive department agencies under DAS’ oversight and procurement authority. Auditors made five recommendations, including identifying and acquiring a modern enterprise procurement system (like OregonBuys) that would provide purchase data of sufficient detail to allow for robust spending analysis. Additionally, the audit team recommends the OSCIO take a number of steps to improve oversight practices, including providing more robust guidance and training for agency IT project management, and better tracking of independent QA reports. I’m excited for this opportunity to partner with Governor Brown to quickly achieve the massive savings identified by this audit. OregonBuys is a win for all Oregonians.